Product prices and availability are accurate as of 2019-04-22 04:04:25 +08 and are subject to change. Any price and availability information displayed on http://www.amazon.com/ at the time of purchase will apply to the purchase of this product. Each colors has real photo. All photos copyrighted by NNJXD 2016. For example,about the pink dress, third to sixth pictures are the new real photo. Lined in side prevents see through: Inner lining with cotton prevents to see through this kid girls gown. 100% Cotton Lace Blending. Package included: 1x Girl Dress, no crown. Size Table means age ranges for girls, They are for general guidance only. For most accurate fit, we recommend checking detailed measurement before purchase. Gentle Cycle Wash and Hang Dry Recommended. Dry Clean is also an option, and will lengthen the use of your NNJXD dress. 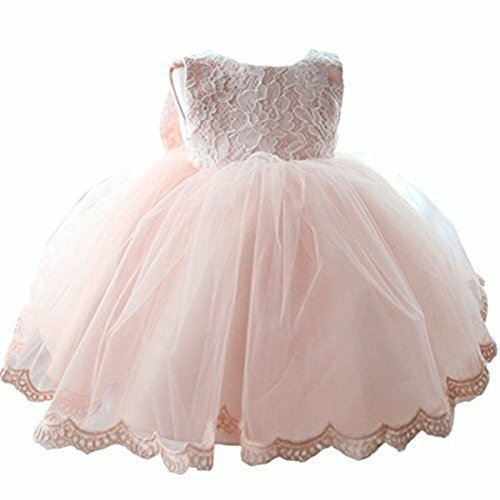 Breathable and lace multi-layer tutu design, sleeveless and sweet elegant hemline, Hidden zipper back easily to allow you to easily get in/out of the dress. Bow is also Removable, providing more optional autonomy design possibility. Suitable for wedding party, holiday party, First Communion, ceremony, baptism, birthday, pageant, artistic photo shoot etc. Would you want your princess freely dancing in the party and be more confidence ? This dress has 3D Flower Lace Embroidery Design and Big Lovely Bow In the Back. Soft and comfortable lining also better protecting the delicate skin of babies and girls, giving them snuggly mom-like protection. Your sweet baby will be the most shining princess in the audience. You will gain a ton of praise!